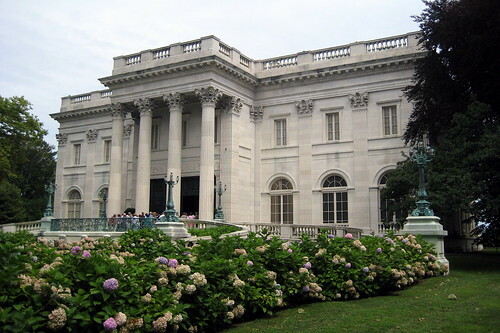 In late July, my father and I visited Newport, Rhode Island, where we had the chance to tour some of the lovely Newport Mansions. We stayed at the Newport Marriot near the harbor. We were both very impressed by the hotel; it was perfectly situated, the room was great, and the public areas were impressive. The nautical decor in the lobby and atrium, on the carpets, and even in the shaft of the glass elevator (where the basement level featured an “underwater” scene) added charm. The gym and pool area were nice, and the gym offered free fruit in the morning. From our room, we could see the harbor, but the view was not exceptional as it looked mostly at the parking lot. Still, I could not have hoped for a better place. The drawback to the hotel was that we had to pay $20 for parking. However, the hotel said that we could leave our car in the lot after check out so that we could explore Newport without having to worry about parking. That sounded like good advice—though we soon realized that it would have been better to have driven. After checking out and storing our luggage in the car, Dad and I walked next door to the Newport Visitors’ Center, which we found still closed. While we waited for it to open, we checked out the minor league baseball stadium across the street. At the Visitors’ Center, we picked up some free maps and bought our tickets for the Newport mansions. I recommend the Newport Mansions Experience. For $31, it allows you to visit five of the mansions, and you do not have to use all of the tickets on the same day; they do not expire. The trouble, then, is deciding on which five to choose. 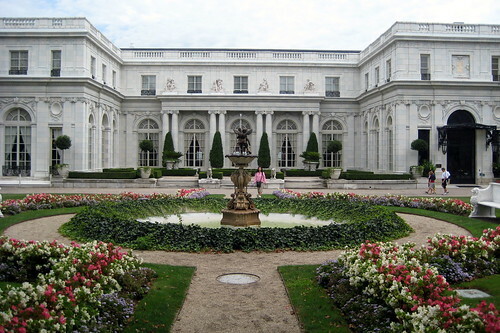 We followed the counter lady’s advice and visited The Elms, Chateau-sur-Mer, Rosecliff, Marble House, and The Breakers. I had wanted to see Kingscote, as well, but I thought it best to listen to the woman. We walked from the Visitors’ Center through the harbor area. We were later told that the harbor was slummy until the city decided to clean it up in the 1980’s. It was pretty appealing with shops, museums, and restaurants. It reminded me a bit of Fisherman’s Wharf in San Francisco. 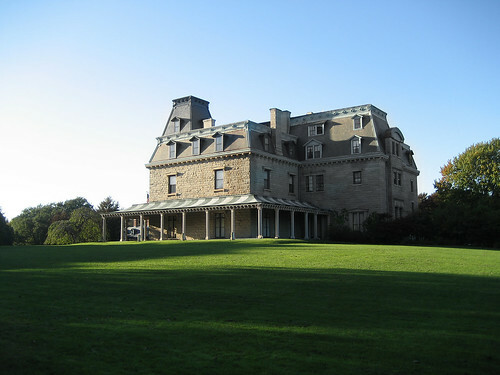 We then started to walk uphill toward Bellevue Avenue where most of the extant mansions are. On the way, we visited Saint Mary’s Church, where John and Jacqueline Kennedy married. The inside of the church was very pleasant. I particularly enjoyed the twelve apostles’ heads above the columns. The first mansion that we visited was The Elms. I cannot describe the mansions justly, and online photographs are rather insufficient, as well. So, I’ll just link some pictures and mention a few random points about each mansion that come to mind. The best thing about The Elms was the grounds; it probably had the best landscaping of any mansion, though without the superb coastline of the mansions on the shore. I especially liked the old beech trees throughout the property as well as the sunken gardens. My favorite room in the “cottage” was the orangerie room that looked out on the lawn. We next walked to Chateau-sur-Mer, one of the oldest mansions in Newport. The design of the house was fascinating, with the central hall open to the top of the house and each floor forming a balcony around the open space. I especially liked the family photographs that decorated the home. George Peabody Wetmore had four children, and they appeared to have enjoyed life a lot. The grounds around the house were lovely, too. I liked the “moongate.” I also liked the gardens around the carriage house with their abundant foxgloves. Rosecliff was our next destination down Bellevue Avenue. It reminded me of a Beverly Hills mansion—perhaps because it resembled the house in the hillbilly show. The ballroom was the most stunning part of the house; it was supposed to resemble Versailles’ Hall of Mirrors, though the house was modeled on the Grand Trianon at Versailles rather than the palace itself. With Rosecliff, we finally got to see the coast. The backyard ran into the ocean, and it was quite a sight. The side rose garden was quite charming. There were some climbers there that smelt lovely. I also enjoyed the dogs’ graveyard near the rose garden. 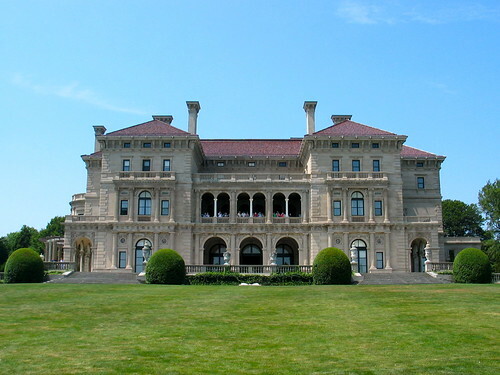 We then walked past the road to The Breakers, which we wanted to save for the end, to see the second most important Vanderbilt summer cottage—Marble House. The exposition of the house focused on Alva, William Kissam Vanderbilt’s wife who had the home built. She was a character—a supporter of the arts and of feminist politics. She also was the mother of Consuelo whom I first “met” at Blenheim Palace outside Oxford, England. For Alva had her daughter marry John Spencer-Churchill, the Duke of Marlborough. 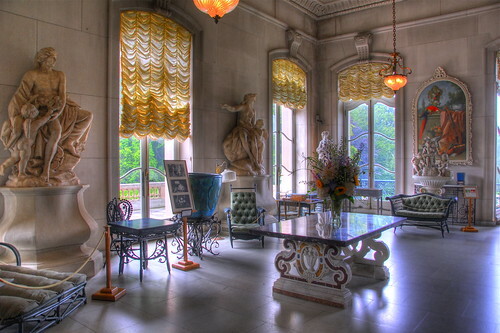 Marble House was remarkable in so many ways. I liked the soft earth toned marble inside the house, and my favorite room was the medieval style library. The golden room was pretty amazing, too. I also liked the pagoda shaped Chinese Tea House in the backyard. 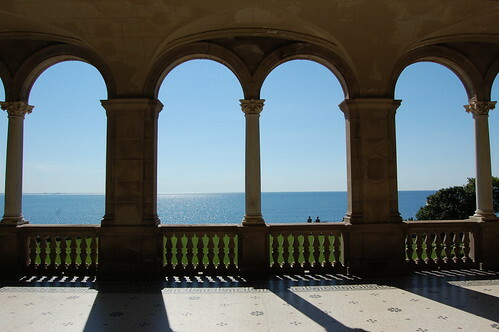 The home, like Rosecliff and The Breakers, had a fabulous view of the ocean. William Kissam Vanderbilt’s older brother, Cornelius Vanderbilt II, had his summer home nearby at The Breakers. It appears that Cornelius inherited the good sense of his grandfather and father, unlike his brother William. For he married a good, wholesome woman, with whom he was a Sunday school teacher, he was a generous philanthropist, and he was an industrious worker. Still, he liked life’s good things. He built homes as a hobby, as architecture and design were ways for him to relax from the family business. He had much to occupy him at The Breakers; it was huge—and extraordinary. It might be over the top, but I liked it a lot. The magnificent central hall, the billiards room patterned after ancient Roman baths, the dining room, and the fountain alcove under the stairs were spectacular. Yet, the most impressive part of the house for me was the two balconies that faced the ocean. They were stunning. Below, you can see the house from the back; the lower and upper balconies are visible. 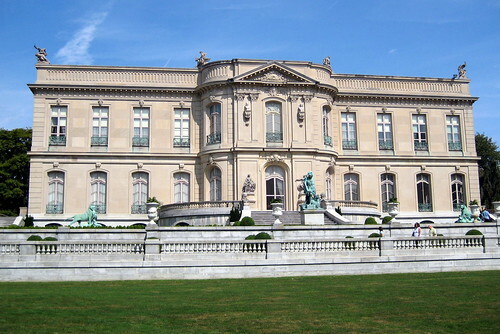 The Breakers deserves its fame as the grandest house in Newport. 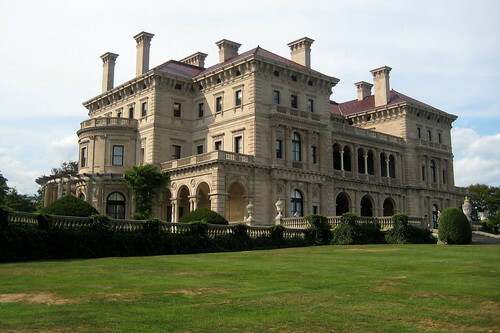 I have not yet visited the Biltmore Estate, which was built by the youngest brother of Cornelius II and William Kissam, George Washington Vanderbilt II, but I think that The Breakers is the finest house that I have so far seen in America. The walk from the Marriot to Bellevue Avenue was not bad, and the mansions along Bellevue Avenue were not far apart. 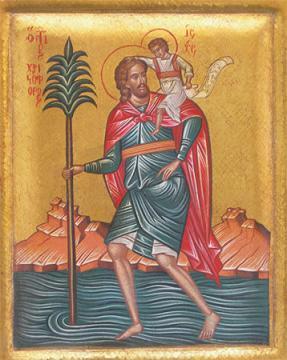 Yet, by the end of the day, my father was tired of standing and of walking. So, instead of walking back to the hotel, we caught a trolley bus that took us straight to the Visitors’ Center next to the hotel. In hindsight, it would have been more time efficient and better for my father had we just driven the car from house to house. The tourism officials warned us about parking, but there would have been no problem. Once we had the car, we drove along Bellevue once again to reach the scenic Ocean Drive along the coast. Repeatedly, my sea loving father mentioned how great it would be to live in Newport—though not in the winter. I can easily see why America’s elite used to “summer” in the town. It is just a shame that most of the mansions have been destroyed since the 1930’s. It is hard to maintain family wealth with socialistic policies that plunder inheritance.